Tags: Complementary Currency, Money System, Club of Rome, banking, currencies, eurozone, financial crisis, Civics, sustainability. 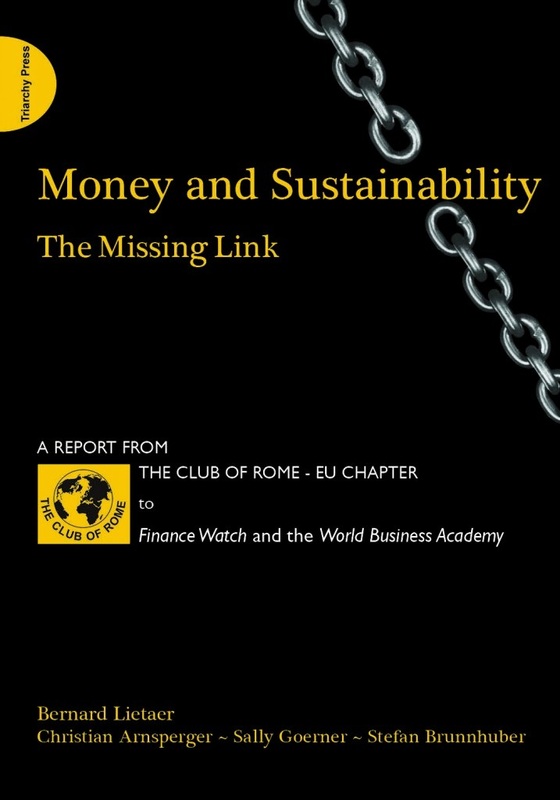 ​A report from the Club of Rome – EU Chapter to Finance Watch and the World Business Academy. Foreword by Dennis Meadows, co-author of the 1972 Club of Rome report The Limits to Growth. Pioneering new research from the Club of Rome: In 1972, the first Report for the Club of Rome – The Limits to Growth – famously spelled out the unsustainable consequences of an economic system that demands infinite growth in a finite world. Just as The Limits to Growth exposed the catastrophic flaws in our economic system, this new Report from the Club of Rome exposes the systemic flaws in our money system and the wrong thinking that underpins it. It describes the ongoing currency and banking crises we must expect if we continue with the current monopoly system – and the vicious impact of these crises on our communities, our society as a whole and our environment. It finishes by setting out clear, practical proposals for creating a money ‘ecosystem’ with complementary currencies to support and stabilise the current money system. Greece and the eurozone crisis: the authors show that one of these proposals (Civics) could be applied, on the ground, now, across Europe, to reduce unemployment, mitigate the adverse social effects of the currency crisis and create a sustainable and flexible money system for the future. This alone makes it essential reading for policy makers, business leaders and economists, anybody concerned about sustainability (environmental, social, climate change), those working in the fields of monetary systems and anyone with an informed interest in the future of the planet. This is a book for anyone interested in understanding the nature of the current financial monetary crisis and the way it relates to broader sustainability issues. anyone interested in complementary currency initiatives. In the wake of the financial crisis of 2008, vast numbers of people have had their livelihoods stripped away and, for many, the future looks bleak. There is a growing gap between the haves and have-nots and the disagreements between policy makers (economists and governments) about how to ‘rebalance the economy’ increasingly suggest that nobody has control or knows what to do. The growth vs. austerity options under consideration will do little to help the financial sector stabilise. According to the IMF, there have been at least 145 banking crises, 208 monetary crashes and 72 sovereign-debt crises in the last 40 years and these are bound to continue if we stay with the present approach. This is a deep systemic crisis caused by the rift between a casino economics based on monetary speculation and the social and ecological realities of our time. The only answer is to reinvent money. Communities are full of underused resources: individuals with time and talents; businesses, voluntary associations and local authorities with spare capacity (hire cars, restaurant tables, printing services, theatre seats, underused buildings). meet the demand for the care and support of the elderly. Finally, they are not at risk from a meltdown in the financial sector.